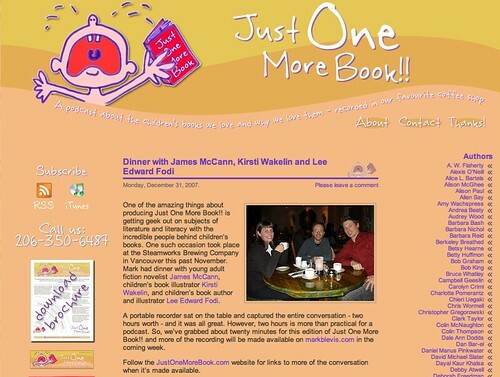 Back in November, I was invited to join Lee Edward Födi and James McCann for a taped conversation with Mark Blevis of Just One More Book!! I’m a big fan of JOMB and I’ve written about it a couple of times on the CWILL BC blog so it was really great to meet Mark in person and participate in the podcast even though I’m deathly afraid of being recorded. The podcast is now up, and it’s a nice slim version of our 2+ hours of conversation. Fortunately, the bit with me stumbling through a response to “what are your inspirations”, a surprisingly difficult thing to sum up with a microphone hovering under one’s chin, didn’t make the cut. Let’s hope it doesn’t make it to the long version on Mark’s own blog either. Mark must also have a super de-nasalification filter on that little tape recorder of his because I didn’t get that overwhelming urge to crawl under the couch in embarrassment when I listened to the recording the other night. All answering machines should come with such a filter. The really great part of the podcast experience was getting to have a conversation with peers. Although James, Lee and I are all members of CWILL BC and live in the same city, we don’t often get a chance to take time out to just meet for a conversation. It was a lot of fun learning about each other’s work habits and tools of the trade and I have to say that they have inspired me – I’m now trying to carry my sketchbook with me everywhere. As for Mark, it’s pretty wonderful to see someone so devoted to children’s lit that they create a whole website and podcast around it. And he’s a great interviewer. 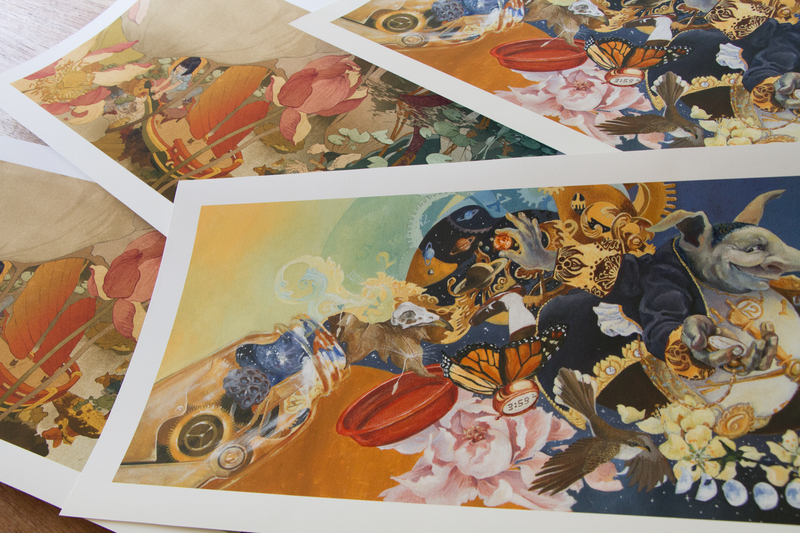 JOMB contains a wealth of information and is a truly priceless look into the inner workings of the children’s lit world. Full of author, illustrator, editor, publisher, etc interviews as well as book reviews, it’s a must visit for any one who loves to read or create books. Some photos from the night are here.